Broker harassment is the act of unscrupulous NYC agents/brokers (who don’t have any real buyers) contacting FSBO sellers and feeding them lies and misinformation in order to break down the seller’s resolve and persuade the seller that the only way to achieve a positive outcome is to hire a traditional listing agent and pay the 6% NYC average real estate commission. As it turns out, broker harassment of NYC FSBO sellers is quite common and one of the main reasons why many traditional FSBO sellers fail. See below for an example of NYC FSBO broker harassment and how you can respond to it. ‘I have a buyer’: In this all to common and completely shameless example of NYC broker harassment, an agent without any real clients contacts a FSBO seller and claims to have a buyer for the unit. This predatory agent refuses to provide any further details about his or her mysterious ‘buyer’ unless the FSBO seller agrees to hire this broker as his/her listing agent and pay 6%. Please note that the vast majority of FSBO sellers are willing to offer a % commission to a NYC buyer’s agent. So under that premise it’s completely nonsensical and downright insulting for the FSBO seller to believe that an agent is only interested in revealing his/her buyer unless they sign an exclusive listing agreement and earn the listing agent commission in addition to the buyer’s agent commission. 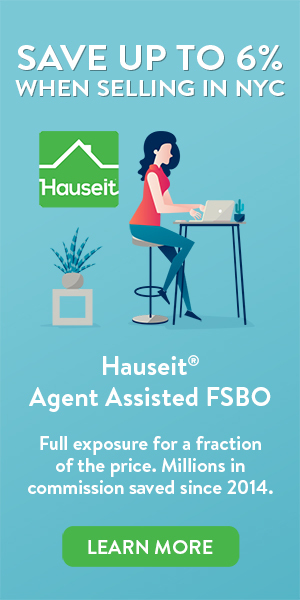 To maximize your chances of success as a Hauseit FSBO seller, we encourage you to check out more examples of NYC agent lies and understand how to deal with broker solicitation as a NYC FSBO seller. A buyer’s agent is a licensed real estate salesperson or broker who represents the purchaser in a real estate transaction. Under the rules of the Real Estate Board of New York, listing agents in NYC are required to share at least 50% of the total commission on a listing with the buyer’s agent in the deal. NYC home buyers must be thoughtful about choosing the right buyer’s agent to work with. Among other considerations, home buyers should consider whether or not their buyer’s agent is willing to offer a NYC broker commission rebate as a means of helping the buyer save money on the purchase. The term used to indicate a listing agent’s willingness to share/split his or her commission on an exclusive listing with an outside buyer’s agent who procures a buyer for the property. In New York City, all REBNY member firms are required to co-broke their exclusive listings with other members of the Real Estate Board of New York. More specifically, REBNY member listing agents agree to cooperate with buyer’s agents and share no less than half of the total commission on a listing with the buyer’s agent. A commission rebate is a completely legal cash incentive paid by a buyer’s agent to his or her client as an incentive for encouraging the client to be represented on a purchase by the buyer’s agent. In New York City, buyers who request a NYC commission rebate can earn $15,000 or more in cash when purchasing a home simply for working with a Hauseit affiliated buyer’s agent. Buyer’s agent representation in NYC is a completely free service for buyers. All commissions are 100% paid by the seller and contractually locked in from the day a property goes on the market. So how does a NYC broker commission rebate work? When a buyer is unrepresented, the full 6% average NYC listing agent commission is pocketed by the listing agent. If a buyer is represented, then half of the commission, or 3%, is paid to the buyer’s agent. It’s from this commission earned that the buyer’s agent is able to pay his or her client a NYC cash buyer agent commission rebate. Are NYC broker commission rebates legal? Yes. NYC Broker Commission Rebates are 100% Legal and Encouraged by New York’s Attorney General. One of the most common NYC real estate agent lies come from buyer’s agents who either: a) Deny that NYC broker commission rebates are legal, and/or b) Claim that they’ve never heard of them. A discount full service listing agent refers to a brokerage which offers a traditional level of service to its sellers but for a reduced commission, often as low as 1%. Working with a discount real estate broker can be an enticing proposition for NYC sellers who don’t have the time to sell FSBO but still aren’t willing to pay the traditional 6% broker fee here in NYC. Although the discount full service listing agent strategy offers sellers substantial commission savings, it’s not without risk. Openly advertised ‘discount’ full service listing agents in NYC often suffer from boycotting by other brokerages (and their buyers). This may reduce your chances of finding a buyer and/or selling for the highest price. In addition, many openly advertised discount brokerages in NYC often times do not provide sellers with the overall quality of service that they expect, even if they are paying 1% instead of 6%. Because a home sale is one of your most important lifetime financial transactions, the cost of incompetence or poor service can be remarkably high. Therefore, the best discount real estate broker in NYC is not a broker at all, but rather a referral service like Hauseit. We pair NYC home sellers with full-service, REBNY member brokerages which have privately agreed to offer Hauseit sellers a discounted commission of just 1% for full service. A NYC Flat Fee MLS package is used by NYC FSBO sellers to market their homes on the New York City inter-broker database (REBNY’s RLS) without having to pay any percentage (%) commission to a listing agent. Due to the unique nature of the NYC market and lack of dominance of a traditional MLS system, NYC FSBO sellers should be very careful when choosing a NYC Flat Fee MLS provider. Many national companies will promise to list you on the ‘local MLS’, but in reality they will not list you on RLS and will most likely list you on the New York State MLS or just the Manhattan MLS. Neither of these MLS systems are as useful in finding buyers for NYC properties as REBNY’s RLS. Furthermore, NYC FSBO sellers should be weary of working with any openly advertised ‘discount’ brokers, as their listings may be subject to retaliation and boycotting by traditional NYC buyer’s agents. NYC FSBO sellers who are looking for full exposure must absolutely be listed in REBNY’s RLS broker database. Because over 75% of home buyers in New York City are represented by agents who almost exclusively show listings that are posted in RLS, a FSBO seller who does not list in RLS excludes three quarters of potential home buyers from viewing his or her property. A quality NYC Flat Fee MLS package will also include syndication to many other highly relevant real estate websites, such as StreetEasy, Brownstoner, Zillow and Trulia. NYC Flat Fee MLS, also known as: NYC Flat Fee RLS, NYC FSBO Listing Service, List Your Home Online, Discount Broker Listing Service, New York City FSBO Listing Pakage, NYC Online Listing Package. Selling a home FSBO in NYC is the act of a homeowner listing a property for sale without the assistance of a traditional New York City listing agent. Sellers who list FSBO in NYC are generally looking to avoid paying the traditional NYC real estate commission and also maintain greater control over the home sale process. As of 2016, FSBO listings in NYC account for roughly 4% of the total properties for sale in the market. However, this statistic does not account for the large number of agent-managed NYC FSBO sellers using services like Hauseit to fully market a property under the guise of a traditional REBNY full-service listing agent without having to pay any percentage commission on the listing agent side. While historically very unsuccessful in the broker-dominated NYC, FSBO sellers are becoming more and more successful thanks to services like Hauseit’s Flat-Fee RLS listing service. A REBNY financial statement is an itemized list of a prospective buyer’s personal assets, liabilities, contingent liabilities monthly income and projected monthly expenses. The REBNY financial statement is designed to give sellers and NYC listing agents an insight into the financial qualifications of a prospective buyer. Given the dominance of the Real Estate Board of New York in NYC as well as the high level of competition for properties in NYC, buyers submitting offers (especially in the case of coops) are almost always required to also complete and submit a REBNY financial statement alongside the other offer materials which they submit either through a buyer’s agent (hopefully offering the buyer a NYC broker commission rebate) or directly to the listing agent. Although the form is quite invasive, any NYC home buyer considering a coop should already be prepared to reveal quite a bit of financial and personal information as part of the coop board application and co op board interview process. In some instances, NYC home buyers may be able to avoid submitting a REBNY financial statement and instead just providing some or all of the following: a) proof of funds, b) pre-approval letter, c) salary information, d) approximation of net worth. Buyers must ultimately follow the offer submission procedure outlined by the listing agent in order to have a shot at winning the property. The RLS is a private broker database of New York City sale and rental listings which are available to members of the Real Estate Board of New York as well as non-REBNY members who are active in New York City. In New York City, RLS is the most widely used broker database and effectively functions as the de facto ‘MLS’ of NYC despite REBNY not being a member of the National Association of Realtors. Although Manhattan does have traditional MLS called the Manhattan MLS which is operated by the Manhattan Association of Realtors (MANAR), it’s not very popular. Only a fraction of NYC brokerages have chosen to join MANAR over REBNY. Therefore, NYC FSBO sellers who are looking to market their listing to represented buyers must absolutely be listed in the RLS broker database.